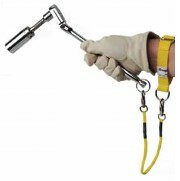 Many types of lanyard are available in the Tools@Height system. Lanyards have lockable snap-hooks to ensure positive tool retention. Lanyards are fitted with a safety label stating the maximum tool weight to be used. Manufactured from high quality materials, all lanyards are batch tested and certified. 1. Tool and lanyard selection needs to be carefully considered to ensure operator safety and comfort. 2. In addition to our wide range of standard lanyards, we will manufacture special lanyards for specific applications. 3. Tools@Height lanyards are fitted with lockable screwgate hooks at each end. Hooks are permanently attached to the lanyard material and so cannot be accidently detached. 4. Tools up to 5lbs (2.3kg) may be attached by lanyard to the operator but a lower limit may be preferable for operator comfort, safety and ease of operation. 5. 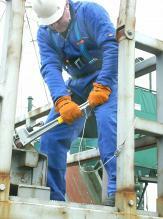 Most individual tools can be attached to the operator by a lanyard. For example, 95% of tools in the Tools@Height system weigh less than 2lbs (0.91kg) each so can be attached to the operator, if required. 6. Most hand tool combinations can also be attached to the operator. For example, assembling a 32mm socket and 11” extension to a ½” drive ratchet gives a total weight of 3.24lbs (1.47kg). 7. Attaching tools to the wrist requires special care to avoid injury to this vulnerable area. Our wrist straps and lanyards are rated for tools up to 5lbs (2.3kg) but a lower limit is recommended. The operator should decide if any tool under 5lbs (2.3kg) is suitable for attachment to the wrist. Tools over this weight must not be attached to the wrist. 8. Tools over 5lbs (2.3kg), and all weights of flogging wrench, should not be attached to the operator. These should be attached, by lanyard, to a suitable fixed point in the work area adjacent to the operator. 9. Select a lanyard to suit the weight of the tool plus any accessories to be used. The weights of each tool can be found on the kit data sheet while each lanyard is fitted with a safety label stating the maximum tool weight it is rated for. 10. One lanyard hook should be locked to a suitable attachment point on the operator’s safety harness, belt, bag or wrist strap. 11. The other lanyard hook should be locked to the tool. 12. Dropped tools or equipment must be reported immediately. 13. After use, or before moving location, lock the tool to a screwgate hook fitted within the bag/pouch. 14. When not in use, both lanyard hooks can be clipped to the bag/pouch external “D” ring and the lanyard stowed inside. 300mm x 10mm web lanyard with stainless steel screwgate locking snap-hooks. 1.0m x 25mm web lanyard with stainless steel screwgate locking snap-hooks. Hi-Vis 6mm urethane coiled lanyards with manganese bronze swivels and stainless steel screwgate locking snap-hooks. Heavy tools should be attached to a suitable local hardpoint using our wire lanyards which comprise 3mm stainless steel wire with screwgate locking snap-hooks each end. For tools up to 15lbs (6.8kg). High strength 3/4" nylon webbing with self retracting inner coil and two stainless steel locking snap-hooks. Extends to 3' 6" approx. High strength 1" nylon webbing with self retracting inner coil and two stainless steel locking snap-hooks. Extends to 10' approx and features an overload warning flag. THCARA25 should be attached to an external anchor point. Due to 10' length and 25 lb tool capacity it should not be attached to an individual.